I have been looking forward to camping so I could try out this campfire recipe. 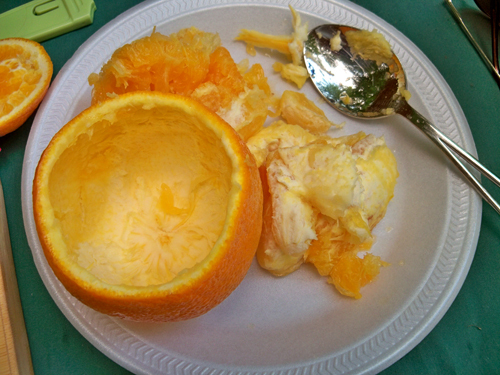 First you cut the tops off of oranges and scoop the guts out with a spoon. 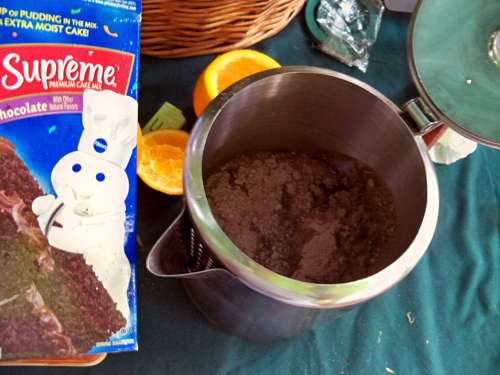 Mix up instant cake mix in your coffee pot. Hah hah. No, only mix it in your coffee pot if you are like me and forget to bring a bowl. Fill each orange up a little past halfway with the cake mix. 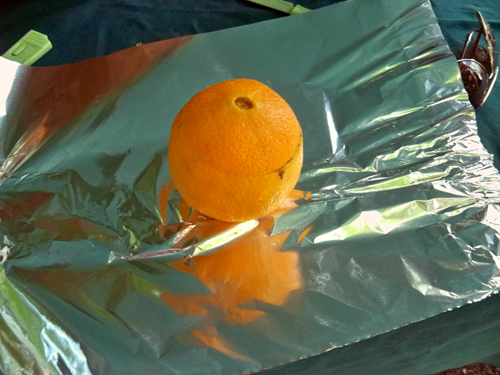 Put the tops back on and wrap the oranges with aluminum foil. Set the oranges in the campfire coals for about 20 minutes. The cake bakes right in the oranges and is very moist with a tinge of orange flavor. I can't imagine cake without frosting so I brought some along to top each cake. 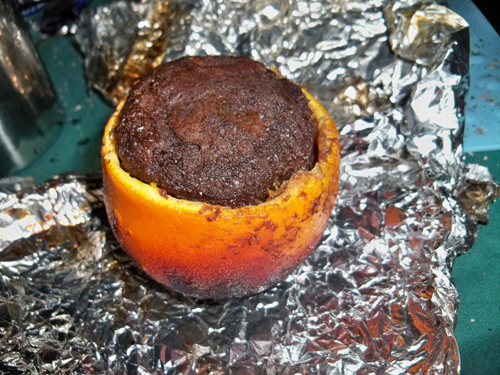 I also served up the cake with some of the scooped out orange. Now I'm wondering what other kinds of cakes I could bake inside of oranges! I notice that some of the cakes are on the edge of the fire, did you rotate them around while they cooked? Also, do you think you could do this on the grill? I think I try it. Hum, but it is not so simple as it as recipe air. All the same, I'll see if I arrive there. I have lot of people at home at the moment, a group of tourists who come to learn the french and taking driving lessons. Yes, I turned the oranges around, even upside down and rotated their positions. I gotta go find that Coleman iPhone app! That sounds delicious and super easy to make! I can't wait to show my husband these! He's a Boy Scout leader and they're always looking for new recipes! I wonder if you could mix some of the orange in the cake batter or the frosting for extra yummy orange flavor. WOW! I have never seen anything like this...so awesome. If I ever go camping I am SO doing this. When I was a kid, we did this at Girl Scout Camp with spice cake. So yummy! These are super yummy with cinnamon rolls inside - top with frosting (obviously!). This may be dorky of me to say, but this is GENIUS. I may actually try camping just to try this. SO copying you.....We did baked potatoes when we went camping...LOL...imagine how long it took?! lol. 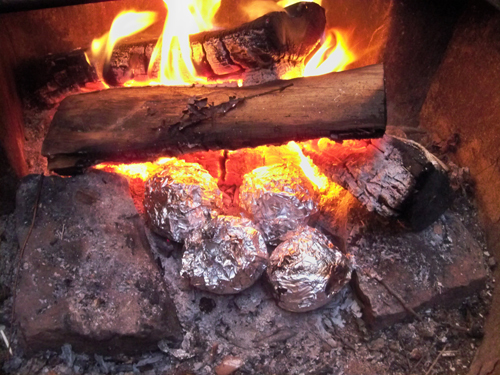 try cutting the potatoes into chunks with a dollup of butter, salt/seasoning then wrapping in foil. works with zucchini and squash as well. So much of camping for me really is the food! We did potatoes this trip too. Took about an hour I think. We had to snack while we waited! Even at home, in the oven, it would be great, kids would absolutely love it!!!! I started following your blog in 2001 - you even posted a link to my blog at the time (http://www.ljcfyi.com/2001/10/linkage-i-cant-understand-word-on.html). Then I gave the whole "blogosphere" a break for a couple of years and now I'm back... Great to know you're still around and better everyday!!!!! Made this last weekend for our fire pit night with the neighbors...everyone thought the idea was awesome and loved the taste of the cake. It was a hit and something we will do again! justjenn - I'm so glad you liked them! Wow, those look amazing! What a great idea! I am gonna make this for my little girl. I am sure she is going to love it. What a unique and interesting way to cook at camp. Thanks so much for sharing this idea! I saw it on Pinterest and it was an intriguing idea. And, by the way, you take great pics! What a genius idea! 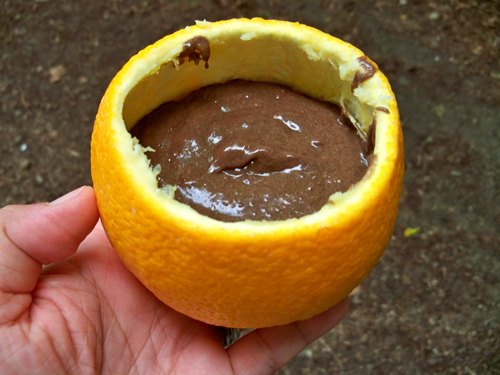 And orange and chocolate are heavenly together! Works great with any kind of berry muffin mix for breakfast! That looks amazing!! Thanks for the idea! Hmmm, cakes, muffins, how fun!! Cheers!! We use Jiffy Blueberry Muffin mix when we go camping... the taste is amazing, and it is a fun breakfast, especially for the kids! I'm going camping in a few weeks and will be making these! It's official, I am going to be taking a million oranges with me camping next time! I am going to try the cakes, muffins AND cinnamon rolls! Thanks for all the great ideas you guys!! oh, this is better than any stuffed banana on the grill. Cake as a bbq dessert, genius! I guess it's not a bad thing to have a little touch of home along for the camping trip. I wonder what other fruits I can use for this though. This is kind of weird considering the taste of the orange zest would kind of stick with the coolness of the ice cream. This is also officially interesting for me because I am quite curious about it. Since I know someone who is pretty much involved with a catering company in Sydney, I've asked her if she could actually make one and she was able to. It really tasted great. Yum. Gave up camping but not desserts. Will try this in my back yard fire pit. This is a terrific and delicious idea! I can't wait to try this during one of our camping trips, too! Hey this is a great idea, thanks! Seeing this makes me more excited for our upcoming trip with my family. We are going camping next month and this would be an amazing treat for my kids. have to try this in my oven...u know, if u bbq them for about 15-17 min instead u might end up with melt-in-the-middle chocolate fondants instead! Yummmmm.......and no need for frosting on the top! LOVE this idea! Just wanted you to know it was featured on our site today: http://www.thedatingdivas.com/food/101-camping-tips-ideas/ Thanks so much for sharing!!! I did this recently....was really yummy. BUT cleaning out the oranges was very time consuming. Like carving a pumpkin. Any tips or suggestions? Try a melon ball maker. Jen- Yes, using a watermelon baller worked pretty well. going camping this weekend...maybe we'll try it! looks so yummy! Has anyone tried his on their BBQ grill? Asking because I don't camp. Yes, I think so. Just snuggle the oranges down amongst the charcoal briquets. I would never have thought of baking a cake that way. It looks like they came out quite well. I can just imagine that the hint of orange made everything taste a lot better too. Thanks for sharing the method and your pictures with us. Super fun idea! I might try this in the oven sometime, too. Would make a fun presentation at a party. Those cakes look awesome! I wonder how do they taste? The idea is very creative. 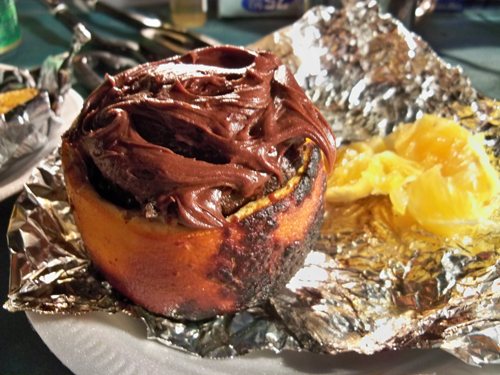 If baked in the oven, do I have to wrap them in tin foil? make some plans for the longer term and it's time to be happy. I have read this submit and if I could I desire to suggest you few attention-grabbing issues or advice. In countries like Kenya, Tanzania and Nigeria, the smartphone is still penetrating at a very slow pace, so we start from the basis that although we talk about mobile payments, we do practically no case of contactless payments via NFC. There the system has been much more archaic since its inception, but no less effective, as seen in the 19.9 million people who use the solutions discussed below. We left the backpacks on a rock and prepared to go around. When we were on the other side, the clouds moved: there appeared a clear sky and the sun rose majestically. At the same time, a cold wind started running. When this fell, it was the perfect time for photographs. There was good light and all the elements surrounding the lagoon were reflected in it like a giant mirror: clear sky, clouds, Pierced hill, snowy mountains, yellow flowers, a quillay and a pine tree that stood around . A hummingbird hovered and several birds were heard. Das Deck konzentriert sich auf die gegnerischen Karten zu begegnen. Der Riese Skelett dient als Tank, während die Speer Goblins Feuerschutz bieten. Der Musketier und Hexe kann auch auf Offensiven gesendet werden, wenn keine hoch HP Feind Karten zu begegnen. Goblin Hut Druck eine Spur, während die Walküre und Pfeile kurze Arbeit von Horden machen. Schließlich ist das Skelett Armee immer zu begegnen Giants und Princes vorbehalten. Später können Sie die Walküre mit einem Drachen zu ersetzen. Die wichtigste Form der Handlung ist die Synergie zwischen dem Giant, Musketier, und Prinz. Die Low-Cost-Karten werden für die Verteidigung der Basis in erster Linie vorbehalten. Die richtige Platzierung ist entscheidend, wie ein Feuerball oder andere starke Bereich Schaden-Karten können kurze Arbeit Ihrer Truppen machen. Schieben beide Bahnen so viel wie möglich. Am besten das Deck werden Sie eine Krone net, wenn Sie alle drei zu bekommen scheitern. Wenn Sie möchten, können Sie den Mini P.E.K.K.A. ersetzen mit einem Ritter. Diese Karte kann One-Shot Spear Goblins, Kobolde, Goblin Barrel, Minions, Skelette, Prinzessin, und vieles mehr. Es kann auch den Benutzer auf ein Elixier Vorteil setzen. Um dem entgegenzuwirken es, Sie brauchen, und versuchen, es zu erzwingen, bevor in Minion Swarm oder Goblins zu senden. Diese Karte funktioniert ähnlich wie Pfeile, sondern muss hinter einem Turm oder einem Tank verwendet werden. Wenn hinter einem Turm, können Sie einen Feuerball verwenden, um es entgegenzuwirken, und wenn hinter einem Tank sollte ein Ritter genügen. Darüber hinaus bedarf es nur 2 Turm Treffer zu gehen. I did cancel one performance in Holland where they thought my music was so easy that they didn't rehearse at all. And so the first time when I found that out, I rehearsed the orchestra myself in front of the audience of 3,000 people and the next day I rehearsed through the second movement -- this was the piece _Cheap Imitation_ -- and they then were ashamed. The Dutch people were ashamed and they invited me to come to the Holland festival and they promised to rehearse. And when I got to Amsterdam they had changed the orchestra, and again, they hadn't rehearsed. Ⲩоur website іs vеry helpful. Tencent jest humongous graczem na scenie gier i Internetu. Jak duży pytasz? Dobrze, że fundusz inwestycyjny China oparte jest także część Activision Blizzard - mniej więcej 12 procent - jak również mniejszościowy udział w Epic Games, twórcy za nierealne, Gears of War i Blade nieskończoność. Tencent posiada również mniejszościowy udział w Robot Entertainment, która rozwija się Orcs Must Die! Seria i posiada prawa do strumieniowego przesyłania zawartości NBA i HBO w Chinach. benarkah vitamin D bermanfaat bagi penderita kanker prostat ? I am attempting to find things to enhance my site!I suppose its ok to use a few of your ideas!! Ini Dia Cara Mudah Mengetahui Apakah Anda Hamil Ataukah Tidak !!! When we first played an early build of FIFA 17 Coins Hack during E3 in June we were a little worried about the gameplay. benarkah penderita luka diabetes tidak bisa sembuh ?